501c3 tax deductible non-profit organization. in the State of Michigan. veterans population and to provide solutions. * Support and encourage veterans and military family members in every area of their lives. be educated and connected to their community resources. * Host events, workshops, retreats and conferences. * Advocate and support sexual assault survivors. There are over 700,000 veterans in Michigan and over 47,000 are women, women veterans make up 1% of the veteran United States population with 14.6% in the active duty ranks. The challenges veterans especially women are in transitioning from military to civilian life successfully factors of unemployment, homelessness, disabilities, undiagnosed health conditions and more. Many veterans especially women need support and assistance and often they tend to isolate if they don't receive the critical intervention of services needed. Awareness is imperative as these issues arise, so does our understanding of the challenges our veterans especially women face each day. Our most sincere hope is to empower our women veterans once again and to help them make a successful transition into all the areas of their new civilian lives and to find self-sufficiency for themselves and stabilize their families. Women Veteran Empowerment is a women veteran led collaboration of members of the Michigan veteran community working together to create a veteran programs that are tailored made to meet the needs and fulfill the desires of the Michigan veteran population and their families. We will not quietly stand by we will act, advocate, we will teach, lead and impact the lives of others. (RET) Sgt. 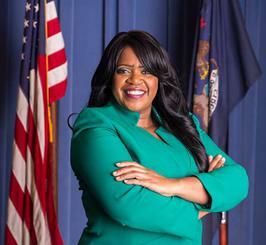 Stephanie J. Shannon is the Founder and CEO of Michigan Women Veterans Empowerment. Sgt. Stephanie J. Shannon is a Amazon best-selling author, entrepreneur, consultant, inspirational speaker and veteran advocate who has over 28 years of experience combined in the fields of business, social service and social work, community development, leadership, ministry, collaborations, entrepreneurship, youth development programs, women veteran’s empowerment, event planning and consulting. She is also the founder and CEO of a youth development non-profit organization, Stepeze Inc. 1999 that empowers youth to become productive members of society. Sgt. Shannon is a honorably discharged disabled U.S. Army veteran who has served her county for eight years including in the 1990-1991 Desert Storm/Desert Shield Persian Gulf War I. She earned a Bachelors Degree in Psychology from Grand Valley State University and is the author of the #1 Amazon Best Seller "Battling The Storm Within". Sgt. Shannon has authored a 2nd book "Our Voices United" Women Veterans Anthology book, she is an inspirational speaker, veterans advocate and is a licensed and ordained Pastor since 2007 in the Christian faith that over sees and operates the "Battling The Storm Within Ministries"
MIWVE leadership believes that respect, integrity, trust and fairness are the hallmarks of all our interactions. We value a culture where everyone is involved, held accountable, respected and appreciated.